High-resolution satellite imagery can offer a cheap and efficient means of monitoring the damage caused to archaeological sites by looting. Remote sensing techniques, particularly those using satellite imagery, can offer a cheap and efficient means of monitoring the damage caused to archaeological sites by looting. This can be achieved either by one-off ‘snapshot’ studies that quantify the evidence of looting at a single point in time, or by assembling time series data that measure changes in the extent and intensity of looting over a defined period of time. This diachronic approach offers opportunities for assessing the impact of factors that might exacerbate or ameliorate looting, including changes in communications infrastructure and land use, fluctuations in the value of the market, and the effects of regulatory interventions or other policy implementations. Satellite techniques are particularly suitable for visualizing the evidence of looting in arid or semi-arid environments, where the ground surface is not obscured by excessive vegetation. The successful identification of pits or other evidence of intrusive site looting generally requires images that are free of cloud cover and have resolutions of at least one metre per pixel. 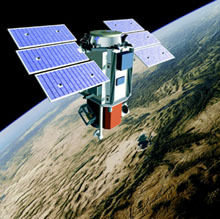 Although the resolution of older images dating back to the 1960s (twenty metres per pixel or less) is not good enough to identify pits or other evidence of looting on the ground, the 2001 launch of DigitalGlobe’s QuickBird satellite with image resolutions up to fifty centimetres per pixel heralded a new era of high-resolution survey. Area north of the Castillo de Tomaval in the Virú Valley of Peru shown in a Google Earth image from 2006, with areas of looting damage outlined in yellow. (Image: Dan Contreras). 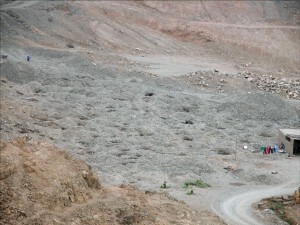 Photograph of area visible in image above, taken in 2006 and showing looters’ pits (Photo: Ignacio Cancino). QuickBird satellite imagery purchased from DigitalGlobe has been used to document the looting that accompanied the Coalition invasion of Iraq in 2003 (Stone 2008a, 2008b). Stone was able to characterize the areal extent of the looting, noting that in total it comprised (as of 2006), ‘an area many times greater than all archaeological investigations ever conducted in southern Iraq’ (Stone 2008a: 137). In addition, she highlighted the selective looting of sites for marketable materials, and for some sites was able to track changes in looting behavior over time. A similar study of looting in Iraq utilised older imagery from a span of nearly fifty years alongside DigitalGlobe images to increase the time depth of the research (Hritz 2008). Image processing was used to improve the resolution of a series of three images obtained between 2002 and 2008 of looting at the Nazca site of Cahuachi in Peru, showing how damage had accumulated over time (Lasaponara and Masini 2010; Lasaponara, Danese and Masini 2012).The major drawback of the method is that satellite images are expensive. Stone’s research, for example, which utilized 9,729 square kilometres of DigitalGlobe imagery, was underwritten by several funding sources (Stone 2008a: 138). By the late-2000s, however, high-resolution images were being made publicly-accessible by Google Earth. The potential of Google Earth imagery for quantifying site damage has been assessed in exploratory studies of Jordan (Contreras and Brodie 2010) and Peru (Contreras 2010), and quantitative estimates of damage derived from Google Earth imagery have been used in conjunction with information from other sources to assess the monetary value of a looted site (Brodie and Contreras 2012). Brodie, Neil and Contreras, Daniel (2012), ‘The economics of the looted archaeological site of Bâb edh-Dhrâ’: a view from Google Earth’, in Paula K. Lazrus and Alex W. Barker (eds), All The Kings Horses: Looting, Antiquities Trafficking and the Integrity of the Archaeological Record (Washington DC: Society for American Archaeology). Contreras, Daniel A. 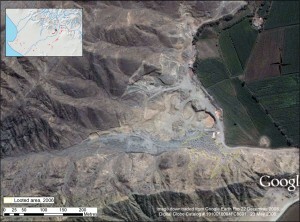 (2010), ‘Huaqueros and remote sensing imagery: Assessing looting damage in the Virú Valley, Peru’, Antiquity, 84: 544-55. Contreras, Daniel A. and Brodie, Neil (2010), ‘Quantifying destruction: An evaluation of the utility of publicly-available satellite imagery for investigating looting of archaeological sites in Jordan,’ Journal of Field Archaeology, 35: 101-14. Hritz, Carrie (2008), ‘Remote sensing of cultural heritage in Iraq: A case study of Isin’, TAARII Newsletter, 3(1): 1-8. Lasaponara, Rosa and Masini, Nicola (2010), ‘Facing the archaeological looting in Peru by using very high resolution satellite imagery and local spatial autocorrelation statistics’, in D. Taniar (ed. ), ICCSA 2010, Part I, LNCS (Berlin: Springer), 254-61. Lasaponara, Rosa, Danese, Maria and Masini, Nicola (2012), ‘Satellite based monitoring of archaeological looting in Peru’, in Rosa Lasaponara and Nicola Masini (eds. ), Satellite Remote Sensing: A New Tool for Archaeology (Berlin: Springer), 177-93. Stone, Elizabeth C. (2008a), ‘Patterns of looting in southern Iraq,’ Antiquity, 82: 125-38. Stone, Elizabeth C. (2008b), ‘Archaeological site looting: the destruction of cultural heritage in southern Iraq’, in Geoff Emberling and Katharyn Hanson (eds. ), Catastrophe! The Looting and Destruction of Iraq’s Past (Chicago: Oriental Institute Museum), 65-80. Contreras, D. and Brodie, N. (2010), ‘Shining light on looting: Using Google Earth to quantify damage and raise public awareness’, SAA Archaeological Record. Contreras, D. and Brodie, N. (2010), ‘Quantifying destruction: An evaluation of the utility of publicly-available satellite imagery for investigating looting of archaeological sites in Jordan’, Journal of Field Archaeology (35): 101-114. Brodie, N. and Contreras, D. (2012), ‘The economics of the looted archaeological site of Bâb edh-Dhrâ’: a view from Google Earth’, in P.K. Lazrus and A.W. Barker (eds), All The Kings Horses: Looting, Antiquities Trafficking and the Integrity of the Archaeological Record (Washington DC: Society for American Archaeology), 9-24.